After taking a loss on Black Friday, the University of Hawai’i basketball team will try to score a discount win on Cyber Monday. The Rainbow Warriors will host Adams State – a NCAA Division II program from Alamosa, Colo. – on Monday night at the Stan Sheriff Center. The game is scheduled to start around 7:00 p.m., and it will be televised locally on Spectrum Sports (channels 16/1016). Hawai’i (3-1) is coming off its first loss of this season, 67-54, against Nevada on Friday night. The Warriors hit season-lows for points, field goal percentage (.385), 3-pointers made (3), 3-point percentage (.188), free throw percentage (.524), and assists (9). Adams State could be the remedy to get Hawai’i back on offensive track. The Grizzlies are 2-4 this season, with all six games against NCAA-II competition. 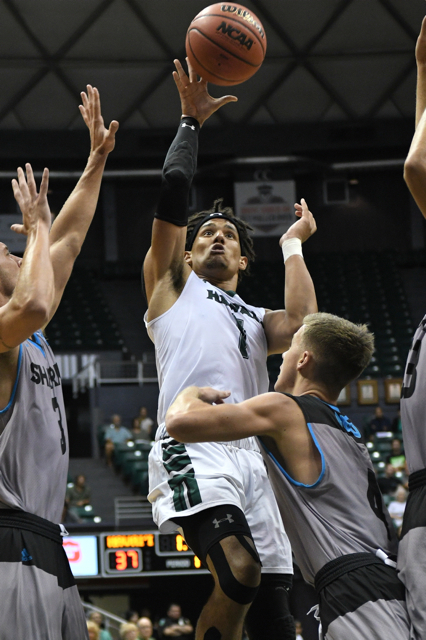 Adams State started the season with four consecutive losses, but went 2-0 to win the Hoops in Hawaii Thanksgiving Classic (hosted by Hawai’i Pacific University) last week. After Monday’s loss, Hawai’i is still averaging 72.2 points per game with a .448 field goal percentage. The Warriors are led by forward Mike Thomas, who is averaging 16.0 points and 7.0 rebounds per game. Fellow senior forward Gibson Johnson is averaging 11.3 points and 6.3 rebounds per game with a .533 field goal percentage. The Warriors are relying on a balanced attack this season, as evidenced by the numbers of some of the other key contributors: sophomore guard Leland Green (10.0 points and 2.8 rebounds per game), junior guard Sheriff Drammeh (9.3 points, 3.0 rebounds per game), junior point guard Brocke Stepteau (9.0 points, 2.5 assists per game), and junior forward Jack Purchase (8.8 points, 7.3 rebounds, 4.3 assists per game). Adams State appears to be a fast-paced team, averaging 85.0 points per game, but allowing opponents to score 90.7. 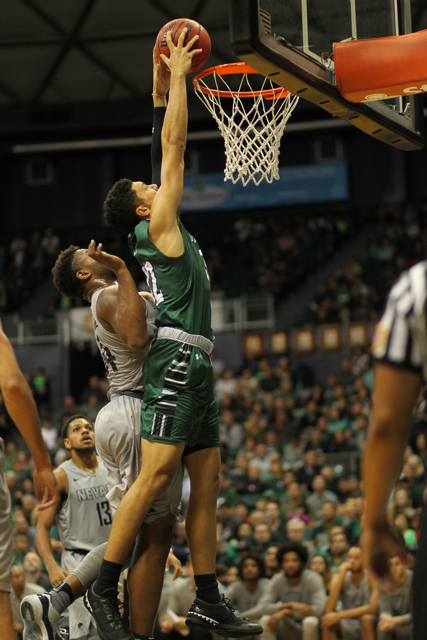 The Grizzlies are coming off an 82-80 win over HPU; Hawai’i beat HPU, 90-70, in an exhibition game on November 1. Brandon Sly, a 5-10 senior guard, is averaging 19.5 points, 5.8 assists and 4.0 rebounds per game. He recorded a triple-double (18 points, 10 rebounds, 10 assists) in a win over Cal State Dominguez Hills last week. Shane Johnson, a 6-4 senior guard, is averaging 18.8 points per game, and scored 26 points while shooting 6 for 6 from 3-point range in the win over HPU. Jarrett Givens, a 6-5 junior guard/forward, is contributing 14.7 points and 3.8 rebounds per game; Frederick Jackson, a 6-8 junior forward, is averaging 10.8 points and 8.2 rebounds per game. The Grizzlies also have a post player named Mike Thomas. Their version is a 6-10 senior center who is averaging 6.7 points and 3.8 rebounds per game. Ticket Information: Lower Level – $30 for all seats; Upper Level (prices vary by section) – $18 or $20 for adults, $16 or $18 for senior citizens (65-older), $5 or $7 for students (ages 4 to high school). UH Manoa students free with validated ID. Parking is $6. Maybe Warriors/bows start BigWest play with only 4 losses…to Nevada. 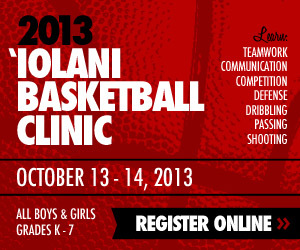 Utah on road and maybe 2 losses in DHC…if Hawaii cannot shoot and free throw better. Scheduling not toughest and BigWest winnable.